One of the most popular areas of research at the moment relates to wellbeing. 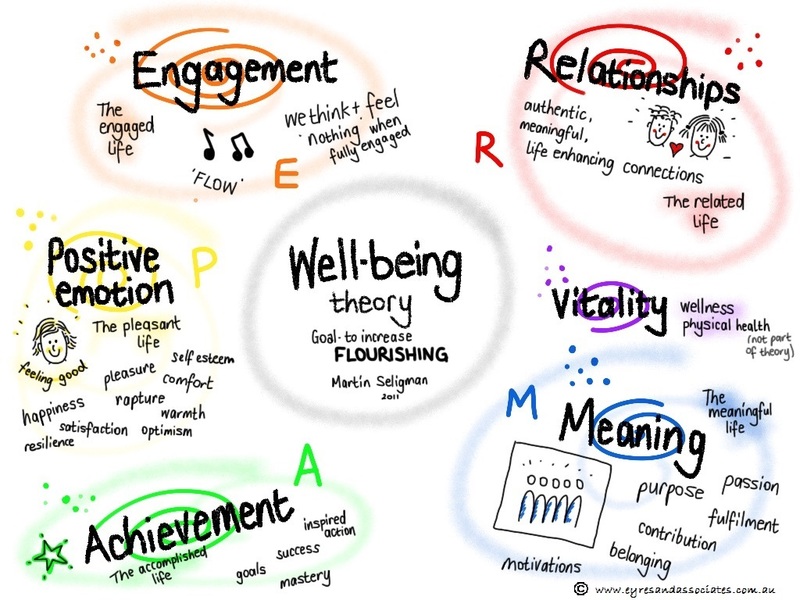 With an increasing prevalence of stress in the workplace, higher levels of burnout, and higher instances of people suffering anxiety and depression, there are many experts sharing their thinking on wellbeing, and what people can do to help themselves to ‘flourish’. Positive psychologist Professor Martin Seligman has spent many years researching ‘happiness’. Positive Psychology suggests that happiness is the natural result of building up our well-being and satisfaction with life. His studies have helped him identify 5 building blocks of well-being. Each of these elements is essential to our well-being and satisfaction with life. Together, they form the solid foundation upon which we can build a happy and flourishing life. Positive emotion – What is the ‘mood’ like in your team? How are you providing positive feedback to your team members? What support are you providing people through an organisational change? Do your team members feel good about themselves and each other? Are you actively working to reduce stressors? Are workloads in the team fair and deadlines reasonable? Is there a sense of ‘hope’ or ‘optimism’ in your team? Do they have ‘fun’? Is there transparency in decision making? Engagement – Are people having the chance to do what they do best every day? Do they get the chance to use their ‘strengths’ – and work in their ‘sweet spot’? Is anyone bored in their role – or stretched too much? Do people get to be focussed, have limited interruptions and have the chance to make progress in their work – every day? Relationships – Do team members work collegially or as individuals? Do they seem to care for each other? Do they back each other up? Do you work on building trusting relationships with all of your team members? Do you explore opportunities for coaching or mentoring? Do actively work to improve cross functional / cross unit collaboration? Meaning – Do team members appreciate the link between what they do and the value they provide? Do you actively work to eliminate non-value adding work? Do they get a chance to see how their contribution makes a difference? Do you know what their motivation ‘hot buttons’ are – and are they being pushed right now? Do you encourage people to build in reflective practice to their day? Achievement – Do team members have the opportunity to be proud of what they are doing? Do you ensure people know what is expected of them? Do you tell them about what they are doing well and why? Do you provide appropriate information, resources, clarity and support? Do you help remove obstacles so people can make progress each day? Do team members get to develop and grow in their roles? Do you promote a culture of innovation? Do you empower others and delegate effectively? Do you make time to celebrate success? Our info visual also includes an element called ‘vitality’ – not officially part of the PERMA model. It considers the importance of physical wellbeing. Do you ensure people have time to take breaks and recharge? Do you ensure people have a manageable workload so they don’t miss opportunities to eat well, exercise and be with friends and family?